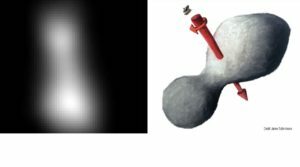 Images taken during the spacecraft’s approach — which brought New Horizons to within just 3,500 kilometers of Ultima at 12:33 a.m. EST — revealed that the Kuiper Belt object may have a shape similar to a bowling pin, spinning end over end, with 32 by 16 kilometers. Another possibility is Ultima could be two objects orbiting each other. Flyby data have already solved one of Ultima’s mysteries, showing that the Kuiper Belt object is spinning like a propeller with the axis pointing approximately toward New Horizons. This explains why, in earlier images taken before Ultima was resolved, its brightness didn’t appear to vary as it rotated.